Last September, Ahoo Malekafzali and myself attended the 18th edition of the Radiance International Workshop, a major event of the Daylighting community, gathering around 50 Radiance1 and daylighting addicts from research, design and industry worldwide. 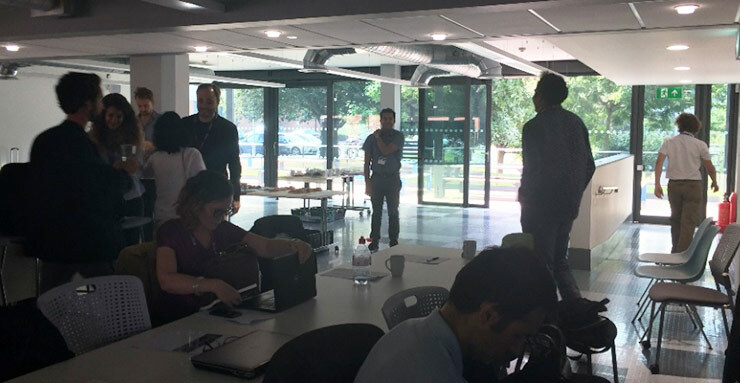 This year, the event was hosted by John Mardaljevic and took place at the newly refurbished Architectural Building (also known as the Keith Green Building) of Loughborough University, UK. As part of the refurbishment carried out in 2017, the glass on the south-west facade was replaced with SageGlass electrochromic glazing. A well-chosen place for discussing daylight and comfort! The workshop was a great opportunity to meet again with some members of the “Radiance Gang” as John likes to call it, and to get to know new people of this growing community. This was also the occasion for Ahoo to present to a new audience some of her latest modelling work on electrochromic glass glare control performance, specifically, on how to assess the risk of reflected glare and then modify electrochromic glazing’s control accordingly. 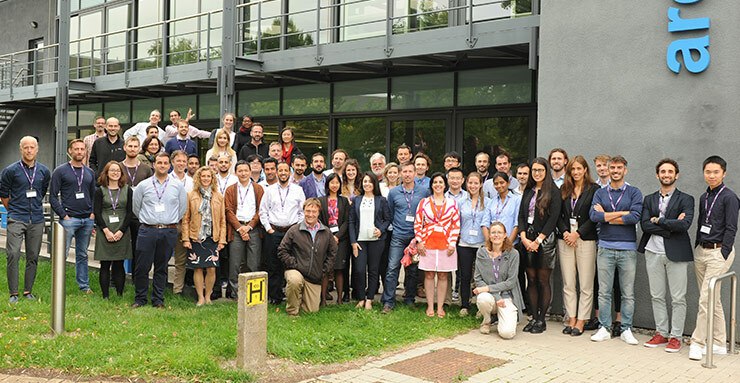 Over the 2 days of the workshop, 32 qualitative talks were given, covering various topics from complex fenestration systems assessment, sky models, case studies, metrics, standards etc. Since I cannot list all the great talks I would like to tell you about my top 4, those I found personally particularly interesting because of their ability to impact how we make buildings better for the people in them. A limitation of existing sky models used for daylighting simulations, such as the Perez sky and the CIE sky, do not integrate any information on color. This is something that might not seem so important when assessing only illuminance levels in a space. However, when it comes to assessing visual comfort, we need to consider not only a lux value but also other parameters such as contrasts, view, and color rendering. Besides, as we know now, the light spectrum has a big impact on the so-called “non-visual effects”, taking into account the color of the sky starts to make much more sense. This will also likely ensure higher realism in renderings generated with Radiance. To develop those colored sky models, spectral measurements of the sky have been taken by a sky scanner installed at the Technological University of Berlin (TUB) since 2014. With such a device, the spectral distribution of different sky patches (145 to be more precise) could be taken every 2 minutes. With those data, luminance and color information of the sky patches could be derived from existing sky models and by regression respectively. Those have been then integrated into Gendaylit that serves to generate skies in Radiance, leading to new options when using this function. Though, the developed model is a preliminary model, applicable for clear and overcast skies only. Further work will be conducted to fully validate the model, and extend it to intermediate skies. 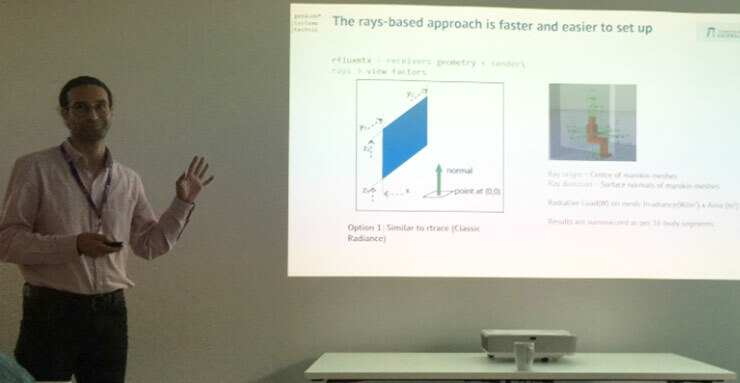 When we think about Radiance, we usually think about daylight modelling, but much less about thermal modelling. However, the research presented aims at using Radiance to estimate the short-wave solar radiation coming into the building and falling on a human body for assessing thermal comfort afterwards. The advantage of using Radiance to calculate the solar loads is a gain in accuracy and speed. Alternative methods such as those based on radiosity2 rely on the modelling of the geometry of a mannequin and the calculation of view factors, which are very time consuming. In parallel, a tool named PhySCo has been developed to predict the thermal sensation (e.g. hot, cold) and thermal comfort. Note that this tool is very similar to the Center for the Built Environment (CBE) Advanced human comfort tool for those who may know it, and relies on the same thermophysiological equations. The solar loads computed in Radiance can be then used as inputs to PhySCo for the thermal comfort calculations. Such approach enables a user to conduct annual thermal comfort calculations using, for example, data from EPW weather files, as well as compare the performance of clear glazing and blinds for each hour of the year. The next steps of the research will include the integration of long-wave solar radiation in the model. In my view, this work opens new exciting ways of quantifying with accuracy the impact of advanced fenestration solutions on people’s thermal comfort in buildings. 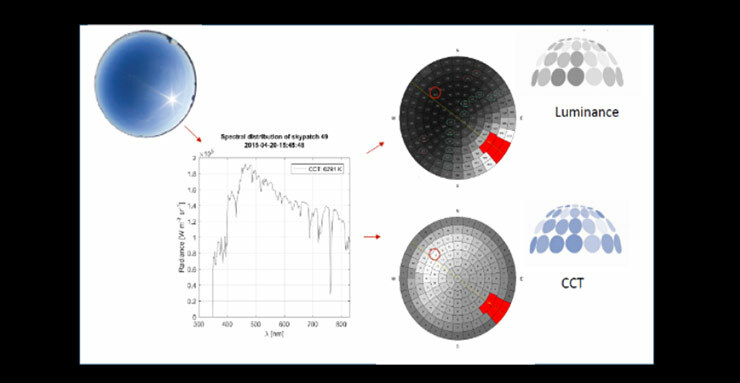 The purpose of this research work was to investigate the effect of evalglare (a function in Radiance to calculate glare sources and discomfort glare indices within an image) methods and options on the accuracy of discomfort glare prediction. 63 combinations of methods and options were tested, and assessment of the accuracy was made on 2 different datasets from a field experiment and a laboratory experiment. The results of the simulations showed significant discrepancies between the different methods tested, stressing out importance of choosing an appropriate method and options in function of each case considered. This also outlined the fact that while modelling is a great tool, the users should still be cautious on the inputs, and always put in perspectives the results of the calculations. I found this work very promising as today in-field measurements of illuminance using traditional luxmeters still raise some challenges, such as intrusiveness for the occupants and risks of reduced accuracy due to obstructions. I will talk more about daylight measurements in a future blog article. Finally, apart from the “formal presentations” that I found very interesting for their high technical content, I wanted to say some words about the “surprise” interventions of Greg Ward (who is the founder of Radiance), Rob Shakespeare and John Mardaljevic at the end of Day 1. At the end, I found it remarkable to see that since the creation of Radiance more than 30 years ago, the interest for daylighting design and daylight modelling has increased continuously, leading to increasing numbers of Radiance users, various evolutions and improvements in the code, and to numerous new modelling software mostly relying on the Radiance engine! And I also realized that we owe this great evolution path to a handful of passionate people, that care about daylight and making better buildings for people, and are opened to connect and share insights with each other and with a wider community, which I hence find myself very lucky to be part of today. 1 For those who are newcomers to the Daylighting “world”, Radiance is a suite of programs for making lighting and daylighting calculations, based on ray-tracing techniques. This is the most validated and accurate tool on the market among existing daylighting software. 2 Radiosity is method historically used in the engineering field of heat transfer, and later on used in 3D computer graphics as a rendering method, particularly applicable for scenes with surfaces that reflect light diffusely. It relies on computing the amount of light energy transferred between 2 surfaces. 3 Luminance describes the amount of light emitting, passing through or reflected from a particular surface and coming to our eyes when looking at this surface from a particular angle, while illuminance describes the amount of light falling onto and spreading over a given surface area. Luminance and illuminance are measured in cd/m² and lux respectively.